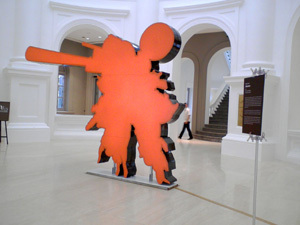 An artist often has tremendous respect for curators, and vice versa. The exhibition title hints that art making and art exhibition/event organising is a craft. The gallery entrance is ‘shielded’ by a large mirror, possibly forcing the viewers to come to terms with our presence; my own disheveled Saturday self was appalling indeed. With no visible wall labels, and given the specific context of the exhibition, it almost felt as if we are gate-crashing a private party – a party for the arts community – or a distant relative of the arts community. The space was obviously segmented, possibly with different intervention or performance spaces by the respective curators turned artists. To the right, the tiny rectangular window is covered by a large wall-to-wall canvas, with an image of Goya’s “Wonderful Heroism! Against Dead Men! peeping from underneath a whitewash. An information counter lie next to it, with the text (whitewashed but barely discernible) “Who says painting is dead?” (or something like that). A couple of brilliant watercolour studies of canons of modern art such as Duchamp’s La Fountaine, Mondrian’s Lozenge, hang modestly in the centre wall of the gallery. A scaffolding with bits of postcards stuck to it reveal remnants of the audience’s participation during the opening night. Perched on top the 2 metre scaffold, are 2 monitors with no images playing on it. To the extreme left of the gallery, we have a large tent, with IKEA spotlights and a desk with two chairs conversing to each other (honestly, that’s what it felt like). 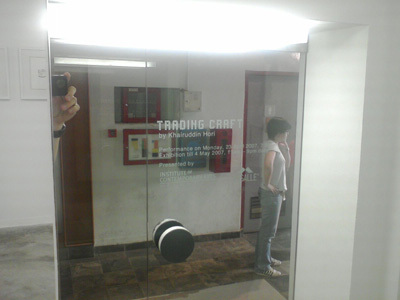 Is trading places, between artist and curator necessary? Does the viewer yearn for reality-tv-style spill-all relations between artists and curators (the organisers of an art exhibition, definition and job scope varies from institutions to institutions)? The exhibition, a subversion of the relationship artists have with curators are barely revealed in the exhibition but more so in the catalogue. Khairuddin Hori surprises by pulling relatively big names such as Wong Hoy Cheong, in curatorial positions to put their heads on the chopping board – is the intention to expose art-making as wacky, performative and theatrical or to suggests the difficulties of art making? Or that curators should step off their ladders/scaffold/plinths to relook at art, sometimes? The conversation between curator and artist is a curious, arduous one. Some liken it to a power-play or struggle, some say it is having afternoon tea with your best friends. Like any other spoken conversations, they are private, possibly disjointed if taken out of context. To the audience, how the work is made may not be important, but what the work looks, feels, means is. Hence you may not get a sense of what is made in this exhibition, which is why I feel gutted for missing the performance/live action. A far comparison, it might have been as interesting as watching our Singapore’s 12 young Members of Parliament dancing to hip hop during Chingay. Which I too had sorely missed. 4.0 of 10 stars. Catalogue available, with details of the curators/artist involved. There is a certain distance when you view the work, something terribly unsettling about the furniture and ‘props’ in this elaborate setup of a ‘house’. One enters the Jendela space into the ‘courtyard’ and greeted by a cluster of hanging green strings, like green clouds raining moss. Next, four pillars made of perfectly straight dangling white cotton string, and into the ‘dining room’. It might be easier to imagine the inhabitants as uber-humans with acquire taste and sits on chairs with a layer of water (or oil, warns the gallery sitter) as cushion, with the view of the Esplanade from the windows. 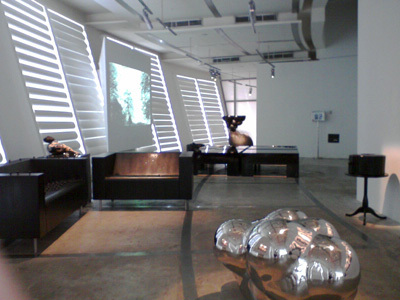 The embellished furniture are sculptures with its function separated from form, ceasing to be sofas. In the minimalist fashion, the mode of production almost is synonymous with the art. On careful observation, they are not leather but possibly wood with plaster finishing. The unsettling effect could be due to the stripping of function of what we commonly accept as given – a chair is meant to be sat on. It is now perhaps a metaphor (to which we look at) for meditation or quiet solace like the the activity of looking at a Japanese Zen garden in minor parts, never fully seeing its entirety. Perhaps the mind sees something else other than these sculpted cloud-like objects, a repeated motif in this installation. The minimalist design of the sets are polished and well constructed, like props in a Matthew Barney film. The individual works seem to hold their own, unfazed by the effect of walking through the curved space, one of the most successful exhibitions that used this jendela space creatively and appropriately. Compared to the artist’s earlier works, the wall hanging photographs find the artist ‘wearing’ his sculptures like a ski mask with freshness and surreal humour. In terms of aesthetics, it reminded me of Sookoon Ang’s equally well crafted, but miniature work. This is comparable, only life-sized – it relates to another domain of the psyche, between imagination and shopping for furniture. 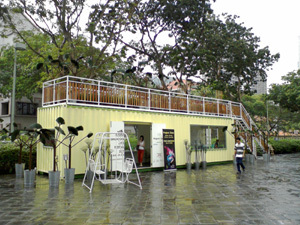 The ‘house’ here is no doubt a vessel; a home a metaphor for other things – security, protection. In its introspection, it opens up new interpretations of the idealised domestic space – no cooking, no cleaning, pure art like in the product catalogues. This almost is the anti-thesis to Rirkrit Tiravanija’s installations, where the gallery space is reclaimed and domesticated. Here, we are reminded that the works contain oil or water, both essential to survival and cooking. Perhaps the key to (understanding) the house, is the importance of art in our living (room), how it fuels ones imagination, as oil and water are to our survival – for cooking and sustenance. 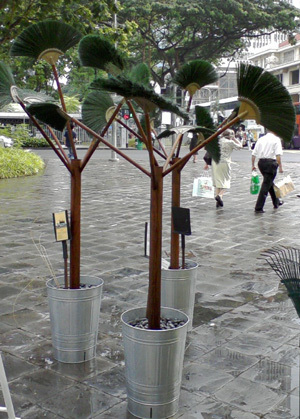 Placed conspicuously near the busy crossroad of Stamford Road and North Bridge Road, the commissioned work by Donna Ong for the Singapore Arts Festival turns more than heads, improvising brooms, paint brushes, toilet brushes, hair clips, plastic ware in the latest make-believe-world work “Eden”. 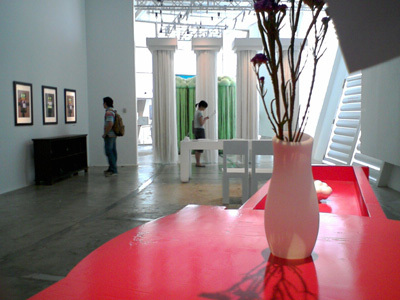 Improvisation has always been Donna’s obsession and methodology, last seen at the four works in the Singapore Biennale 2006. It is encouraging to see commissions of this grand nature (sic), bearing continuity and interest. The strength of the work seems to lie in turning everyday objects, in a surrealist/Dada fashion into a completely unexpected idealised garden, where our imaginations do the filling in like a child playing make-believe. Yet there’s something disturbing about the work, like Guillermo Del Toro’s PAN’S LABYRINTH, where the lead character finds herself shot but finding her ‘imaginary’ underground kingdom, while the viewer possibly reads the ending the other way and weeps as the girl lay dead. Similarly, we question what we see, nothing more than toilet brushes masquerading as tulips. I’m reminded of the fairy tale Cinderella, where objects are transformed magically; the reality hits the viewer when another person steps onto the platform. It may be interesting to consider the work by comparing it to Singapore’s tourism tagline, Singapore the garden city. 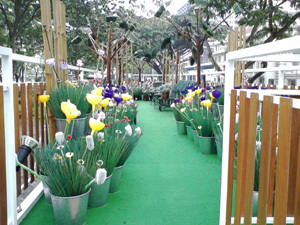 Is Singapore the metropolised ‘Eden‘ or a fake garden? How many Singaporeans actually have green fingers, and keep plants larger than $2 cactus? While these rhetorical questions linger, I am certain the work will be enjoyed by many in this busy area, especially those who have no time to stop and smell the flowers to appreciate art. Those who have seen the work may agree with me, it resembles a splatter of paint in space, in the traditions of Roy Lichtenstein “Brushstrokes” seen at Millenia Walk Singapore. It seems to shout “pop art”, unlike the artists’ earlier subtle prints or paintings on fabric over a lit frame or stretcher. This splatter blinks on both sides, any brighter will resemble the strobe that will cause epilepsy. The workmanship is appalling – the ‘front’ and ‘back’ are slightly misaligned and the spray paint is spotchy on certain parts – compared to the industrialised production methods of the Minimalists. The imperfections however, revealed the complexity of bending aluminium to a desired odd shape, riveting the pieces together in gravity defying positions. In the context of the National Museum, we are indulged to believe that the work alludes to some form of national identity, the political comment made by former Indonesian president B. J. Habibie, referring to Singapore as a red dot. This dot, is now a splatter, a more creative expression than a mere ‘dot’. I suspect the work is better represented at night, perhaps on the facade of the building where the ‘blink’ would do the work more justice, against the flowing traffic and imposing colonial architecture. 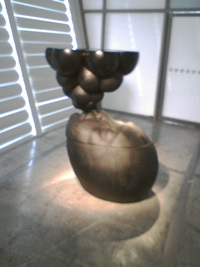 Indoors, it is dwarfed by the tall hemispherical dome, and not allowing the visitor to have any critical distance to consider the juxtaposition of the two. Eager visitors by day pass the sculpture (not installation, stressed the artist) unaffected. Perhaps the work is a double edge sword, with its meaning fixated on “a false belief or opinion: delusions of grandeur”, a pun gone wrong. In this case, the artist has stabbed his own foot, and splattered more than just blood. Nonetheless, the work read in this context, the statement is a daring one, challenging the museum (as many contested the need for the overtly lavish opening party last December) in a pop-art-ish way that Warhol would have been proud. Superstring a series of single continuous line drawings by Joshua Yang in collaboration with students from NUS High School of Math and Science. The work is an impressive array of large canvases hanging 3.5 metres down the grand concourse steps. From a distance, they resemble giant looms, bearing freshly produced cloth. The centre pieces, the first on black fabric, consists of a drawing of the ubiquitous foot paddled Singer sewing machine on the left, and a large drawing on white paper, of a brain hiding in the centre arrangement. 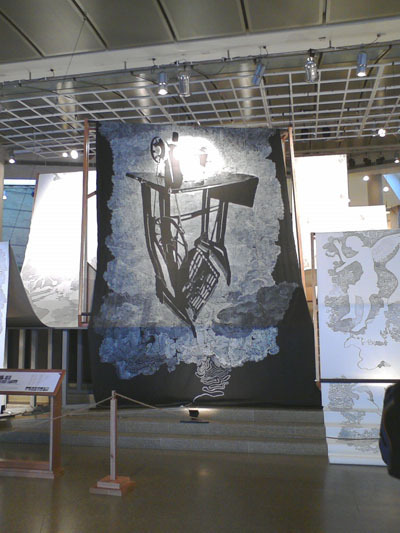 On closer inspection, portraits, figures, angels and everyday ‘random’ objects drawn in ink, fills these large fabrics. The connection between the objects are physical – each object is made with a single line, and all objects are formed with a single continuous line, like a thread unraveled carefully by divine intervention. There are at least two issues that the work engages with: firstly, the activity of drawing as a cerebral activity, which some adults will frown upon as ‘no-brainers’; secondly, the alleged specificity to the site (Esplanade concourse) and concept. 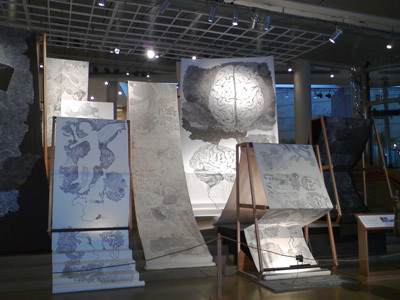 The large drawing of the brain has a particular significance. According to brain studies, and popular art educationist Betty Edwards, the activity of drawing engages the right hemisphere of the brain, which is visual and processes information in an intuitive manner (). Incidentally the right hemisphere of the brain is usually connected to creativity. The depiction of the brain could be a reminder to the viewer of the processes involved in drawing and creation. 2.	the line must be continuous and have no breaks. The notion of draughtsmanship is echoed in the explanatory text. By making doctrine-like instructions, does it make any one-line drawing art? Who decides which drawing links to the next, and how? Do doodles become art if they are big enough? Do these students ask enough questions when they draw? The work links to “Superstring theory which suggests that everything in the universe is made up and connected by symmetrical vibrations” (exhibition text). Perhaps seen in this connection, the work is successful and apt for students to see links between science and art, like how the great Italian renaissance men saw themselves, perhaps to re-link contemporary thinking, science advancement and ethics, to age old reasoning and ‘universal’ morals. We are all perhaps desperate to see connections between actions, consequences, objects and events, justifying existence. Or we are like the kitten that enjoys the ball of yarn for no apparent reason other than play.